What Is IRS Form W-9 and How Should You Fill It Out? 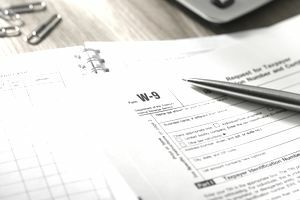 Completing IRS Form W-9 isn't something you generally have to deal with unless you're an independent contractor, a consultant, or another self-employed worker. When you're contracted to provide services to another company and it's expected that you'll be compensated more than $600 a year, the company will ask you to provide a W-9 form. It then uses the form to prepare Form 1099-MISC, reporting the amount of income that's paid to you or your company to the Internal Revenue Service. You might also be asked by your bank or another financial institution to complete Form W-9 so that they can prepare various types of 1099 forms to report to the IRS any interest, dividends, and other types of income you've earned. You might be asked for one when you're opening an account. Some real estate transactions require W-9 forms as well, and you might be asked to complete one if a lender cancels a debt that you owe. Where Do You Get Form W-9? In most cases, the business or financial institution will give you a blank Form W-9 and ask you to complete it. If you or your company is in the position of having to issue Form W-9s to independent contractors, you can download the form from the IRS website. Completing Form W-9 is pretty straightforward. Just provide your name on line 1, and your Social Security number in Part I. Your name should match the one that appears on your tax return. Enter your address on lines 5 and 6. Use the address on your tax return if your business address is different from your home address. Businesses should indicate their name on line 2 if it's different from your name, and their employer identification numbers in Part I. You're certifying to the IRS that the tax ID number you're providing is correct and accurate when you submit Form W-9. Form W-9 is a standard tax document. By itself, it doesn't pose many problems, but there are a few situations that might wave a red flag. You don't know the person or business that's asking you to fill out the W-9. You should always exercise caution when giving out sensitive information like your name, address, Social Security number, or employer identification number. Make sure you know who's asking you to fill out the form, why they’re doing so, and how the tax information you supply will be used. Be sure to send the W-9 securely. Don’t send your completed W-9 as an unsecured or unencrypted email attachment. Use a secure method of delivery, such as hand delivery, mail, or an encrypted file attachment to an email. Ask what types of tax documents the requester intends to provide to you based on the information contained in your W-9. If you're unsure why you're being asked to complete the form, ask what types of tax documents you can expect to receive when the information is used. You expected a Form W-4 instead. If you're starting a new job and your employer hands you a W-9 to fill out, ask if you’ll be working as a self-employed independent contractor or as an employee. Employees complete Forms W-4, not Forms W-9, to set their tax withholdings. Self-employed persons don't have taxes withheld from their pay—they're responsible for making payments to the IRS on their own. If your limited liability company (LLC) is its own separate tax entity, such as a partnership, a C corporation, or an S corporation, report the name of the LLC and its federal employer identification number on the Form W-9. Check the appropriate tax classification box at line 3, indicating whether you're a partnership, C corporation, or S corporation. Do not check the limited liability company box. This sounds counterintuitive, but it's what the IRS wants. If the LLC is owned by another LLC, you would then check the limited liability company box. You must also indicate the tax classification of the parent LLC. If the LLC is owned by a single member, indicate the tax classification of the owner. If the LLC is owned by a single member who is a person, the IRS says that you must indicate the name of the owner on the “name” line and the name of the LLC on the “business name line.” The IRS prefers that you report the owner's Social Security number instead of the LLC's federal employer identification number in this case. You must also certify on Form W-9 whether you're subject to backup withholding. Backup withholding is a flat rate of 28 percent on payments made to you or your business under certain circumstances. There are two common reasons for backup withholding: Your name and Social Security number don't match IRS records, or you have one or more outstanding tax debts and the IRS has notified you that you're subject to mandatory backup withholding until these taxes are paid in full. Real estate transactions aren't subject to backup withholding, so you can cross out this section if you're completing a Form W-9 for this purpose. Most corporations are exempt from backup withholding as well, but corporations might be required to supply a code in the "exempt payee code" box at line 4. The same applies if you're exempt from reporting under the Foreign Account Tax Compliance Act (FATCA). In this case, you would enter the code in the box marked "Exemption from FATCA reporting code" in the same place. How often should I update a Form W-9? You should submit a new Form W-9 whenever your information changes. Fill out a new form if your name, business name, address, Social Security number, or employer identification number have changed. I received a W-9 from an unlikely source. What should I do? Some people have received requests for Forms W-9 from landlords and other people or businesses. Form W-9 is used to officially ask a person or business to provide their name, address, and taxpayer identification number so that the requesting party can properly issue tax documents to the IRS. In general, any business that pays you interest, dividends, nonemployee compensation, or other types of reportable income will probably request Form W-9, so it seems unlikely that a landlord would ask you to complete one. If you receive a W-9 from an unlikely source who you don't expect will be paying you money for any reason, ask why it's needed. Don't complete it and submit it if you have misgivings, at least not without consulting with a tax professional first. I received a W-9 from my employer. What should I do? If you are or were being treated as an employee with a regular paycheck and your employer suddenly asks you to fill out a Form W-9, this indicates that your employer now wants to treat you as an independent contractor. This can be a rather sticky situation. On one hand, there are some legitimate reasons why you might become an independent contractor rather than an employee. On the other hand, employers sometimes run into financial difficulties and can no longer afford to pay their half of payroll taxes. Reclassifying you as an independent contractor provides an out for them. They don't have to pay these taxes if you're considered self-employed. First ask yourself whether you are an employee or an independent contractor. If you think you're an employee and you can't reach a consensus after talking with your employer, you can ask the IRS to make a determination of your work status. Of course, your employer might not appreciate this, but it's better to be safe than sorry. If your employer reclassifies you as an independent contractor, you become responsible for paying his half of payroll taxes as well as your own as a self-employment tax. You're generally not an independent contractor if your employer decides when, where, and how you should do your job, when and how you're paid, or if the job provides any sort of employee benefits.